There is no XBRL without computer software. The entire endeavor is designed to allow for corporate financial statements to be machine readable and comparable by automated analytical software. Computer code is the foundation of XBRL, and a large number of companies are selling excellent tools for the creation, utilization, and validation of XBRL code. However, an equally large number of companies have touted the ability of their software to be the only tool necessary to ensure the compliance, quality, and accuracy of XBRL filings. Without denying the centrality of software, RDG believes that the promotion of automated tools alone overlooks the importance of the most important and powerful tool available – the human brain. It may be trite, but it’s also true. Corporate filers that rely solely on software systems to build and validate their XBRL filings do so at their own peril. The Limited Liability period is over, and the SEC has already rolled out three new fraud detection initiatives all made possible by the RoboCop automated enforcement tool that will automatically trawl through XBRL filings immediately upon filing. After your XBRL filing is submitted to the SEC, it will be analyzed by computers for both government enforcement and financial analytics purposes. Computers will be picking over your XBRL code, do you really want it to have been built and validated by computers alone? The fact is that due to the nature of XBRL (and of course to the nature of corporate accounting), there is no way to remove the human element from the process altogether. Even the creators of the most robust validation software tools available admit that software can only go so far in checking the accuracy of XBRL code. To properly analyze and ensure the highest quality XBRL, a person with experience and expertise must be involved. 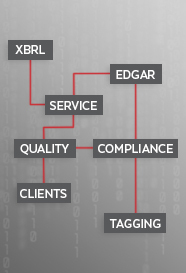 To be sure, RDG employs the assistance of numerous validation software tools, but we consider the close attention of a XBRL Professional CPA to be the most important aspect of our Quality Assurance processes. Just as it would be impossible to audit financial statements with automated software, XBRL code cannot be properly vetted by machines alone. RDG Filings has the knowledge, expertise, and experience to ensure that the AQM-RoboCop tool being deployed daily by the SEC is far less likely to flag your XBRL filings.